My hairstylist is very big on pink (She had pink streaks in her hair when I first met her). She saw one of the felted bags I had made for myself and jokingly asked me to make one for her. 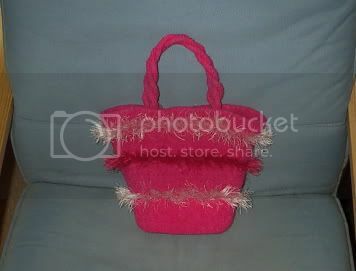 I decided to design a little fluffy bag for her as a Christmas gift. It is, of course, very, very pink. Also, big, big thanks to Stitchcounter for test-knitting this pattern for me! Set of 5 stitch markers, one of which should be a different color to mark the start of the round. Using 2 strands of Merino Wool, cast on 76 sts. Join to work in the round. NOTE: Follow desired stripe pattern while working below instructions. Round 1: K9, PM, K20, PM, K18, PM, K20, PM, K9, PM for beginning of round. Arrange stitches onto 2 needles, and use 3-needle bind-off method to close bottom of purse. Usin 1 strand of Merino Wool, knit 4 24″ pieces of 4-stitch i-cord (I used my Embellish-Knit cord maker). After felting, twist two cords together for each handle, and pin them down until they dry. Attach to inside top of purse. Put bag and handles into pillowcase or mesh laundry bag and run through wash cycle using hot water and lowest water level. You may need to add a pair or two of jeans for agitation. When the bag has reached the desired level of felting (Mine took 20 minutes), remove from the washer (do not let it spin). Squeeze out water using towels, and lay out to dry, pinning twisted handles as above. Once the bag is dry, you may need to trim the Fun Fur on the inside, or it may fill the interior of the bag. Once it is felted, this is no problem â€“ just give the bag a haircut close to the inner surface. I love your new header, it looks great! Spiffy button!